Laundromutt in Cambridge, MA and its BYOD sister stores in Newton Centre and South Boston are a family operated business with Elizabeth at its helm. Laundromutt was the first self–service dog wash in the Greater Boston area. She was inspired by her first German Shepherd, Maya. Throughout her eleven years, Maya battled skin issues such as rashes and hotspots caused by allergies. One of the best remedies for her skin problems was frequent, medicated baths. 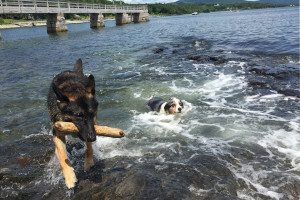 Groomers were an expensive option, the claw and ball bathtub at home was a messy and back–braking option and holding Maya under the cold–water hose in the backyard was not an option at all. It was through her trials and tribulations with Maya’s skin issue that Elizabeth realized the need for a self–service dog wash. Thus LaundroMutt’s (and now BYOD Dog Wash’s) mission became clear: to promote the health and wellness of dogs through bathing, a healthy diet, plenty of mental and physical stimulation and consistent training. Elizabeth graduated from Skidmore College with B.A. in Biology, concentrating in zoology and animal behavior. In college she spent time abroad studying wolf and red deer interactions in Poland. After graduating, she moved to the great midwestern state of Minnesota with her future husband, Evan. She immediately found her place at the Minnesota Zoological Garden (The Minnesota Zoo) as a dolphin trainer. In the Marine Mammal department, she trained dolphins and studied their social behavior and learning processes. Eventually she was promoted to a zoo keeping position in the Asian Tropic department. There she cared for a horde of animals including gibbons, leopards, otters, bears, etc. Don’t get her started on the tapirs! Elizabeth was soon lured away by Peggy Callahan at the Wildlife Science Center (W.S.C. ), a non-profit in Forest Lake, Minnesota. The W.S.C. is a nationally recognized education and research facility. It is home to a multitude of animals, including no less than 50 wolves. 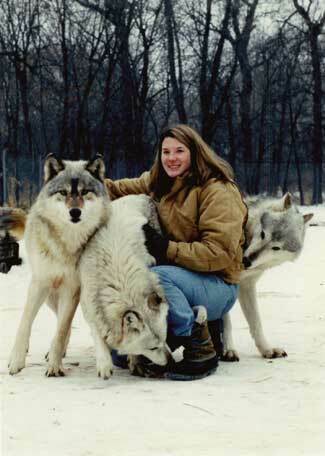 Her first official position was as a Den Mother to two litters of 15 4–week–old wolf puppies. In her seven years at the W.S.C., she raised 5 more litters of wolf puppies, 2 black bears, 2 Bobcats, a fox, and several other quadrupeds. At the center, she also worked as a wildlife manager overseeing the wellbeing of all the animals, took part in the on–going research projects on breeding and cardiology studies on wolves and taught education and training programs to the public. These experiences have given her an invaluable foundation in animal care, behaviorism and education. By the time she left, Elizabeth had been elevated to Assistant Executive Director of the W.S.C. After a successful career in graphic design and animation, Evan now dedicates his time to LaundroMutt and the BYODs. Evan is the official designer (and handyman, bookkeeper, computer repairman, etc). He has meticulously scrutinized everything from the design of the logo and the colors of the walls, to the placement of the tubs and shape of the divider walls. Yeah, there’s some OCD happening here, just ask the staff. When Evan is not working on broken vacuum or rearranging the dog leashed by Kandinsky’s color theory, you can find him engrossed in many different sports and activities. 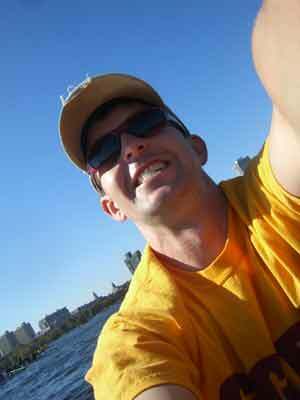 He is an avid rower and plays Ultimate Frisbee. His Australian Shepherd, Brumby, is a great practice partner. Some of Evan’s other favorite ways to past the time are fly–fishing, sailing, tennis, skiing, cooking and sometimes . . . sleeping. Our Aussie Brumby and German Shepard Azteca (a.k.a. Teca) are the Laundromutt and BYOD brand mascots. When Brumby is not fighting off his younger sister’s attempts to get him to play, they also do product testing and tasting.